Hello there! 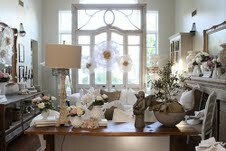 I’m Joanna from Arcadian Lighting, the perfect resource for lovely light fixtures of all kinds. I love creating guest posts for design blogs like Dayle’s. I live my passion everyday—writing about decorating in all its glorious forms. Today, I’ve brought you a few of my favorite chic country spaces. Hopefully, you’ll garner some decorating ideas for your own home. Thanks for letting me share. A chic entry does double duty as a mudroom with its coat rack, umbrellas and boots. 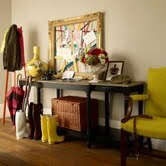 The yellow vase balances the yellow chair off to the side of the console. A seaside cottage features lots of wicker, a shell collection and pretty table linens. 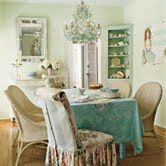 The pretty chandelier and Venetian mirror give it a dressy touch. This gorgeous country kitchen has so many wonderful elements from the oversize lighting fixture to the weathered armoire. Wouldn’t you love to see the rest of this space? A rustic white vignette boasts a weathered bench, white washed floor boards and a collection of glassware. This charming kitchen displays a collection for vintage ceramics and china in a rustic china cabinet and on a distressed table. I love the pale pink and minty green. 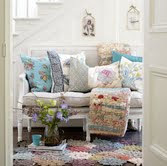 A plethora of vintage pillows sit nestled in a settee along a staircase wall. The elaborate textured rug is so lovely. This country living room has layers and layers of found objects from tiny wall sconces to architectural elements. A large chandelier would be perfect with the room’s soaring ceilings. 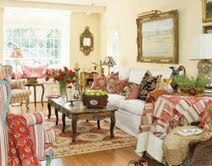 A cheery country living room is dressed in layers of red, gold and cream. The patterned rug anchors the space. Love the blue painted frame and legs on the wingback chairs. What did you think of these chic country spaces? Don’t forget to leave us your comments in the section below! Afterwards, come over to Arcadian Lighting to find fantastic fixtures to decorate your country space!